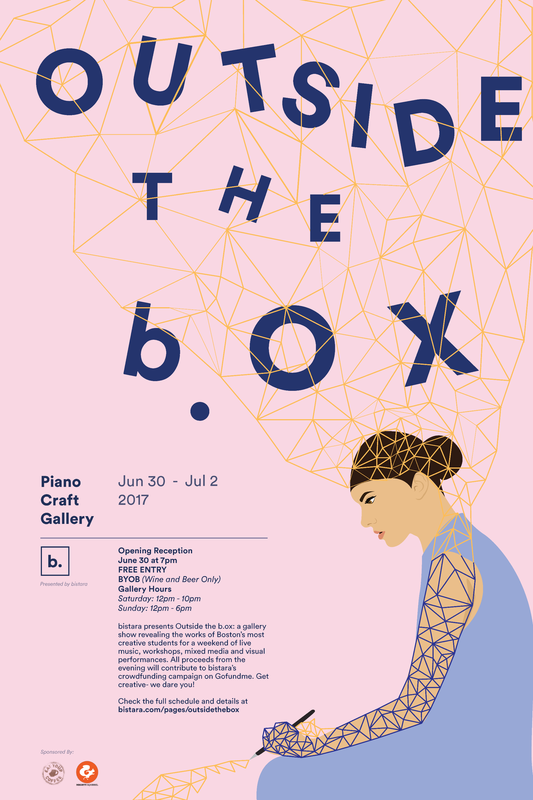 Boston, Massachusetts – Outside the b.ox will be presented by bistara June 30-July 2, 2017, at the Piano Craft Gallery. Bistara presents Outside the b.ox: a gallery show showcasing the works of Boston’s most talented creative college freelancers. Experience creative entrepreneurship through photography, film, design and other mixed media on view. Participate in daring weekend workshops and contribute to fearless conversations that will shape tomorrow’s creative industry. Our goal: fueling your creativity. Opening Reception: Friday, June 30, 12-7 p.m.
Gallery Hours: Saturday 12-10 p.m. | Sunday 12-6 p.m.
From Bogotá, Colombia, semi finalist on La Voz Colombia, performer and vocalist Ana Maria’s style ranges from Latin American folk, Spanish rhythms, and Flamenco. She is currently working on her first full-length album with her coworker at Flamenco Boston, Anthony Tran, while also working on the promotion and expansion of the company inside and outside the New England area. From Mexico City, Marco brings an exciting performance packed with audience-artist interaction full of fun, funky pop mixed with romantic lyrics in Spanish. For several weeks he has been positioned on Spotify’s Peru Top 50 Viral playlist on the first spots, as well as on Mexico’s Top 50 Viral. Mares’ soulful music reflects on love in its purest form. YOU CAN do anything today! Learn how to manifest your innate desires into entrepreneurial action, whether that’s building a business, getting your side-hustle or creative project off the ground, or making a difference within your organization. What makes you unique? Each of us have a story – one that gives you the power to affect lives. Learn how to set yourself up for opportunities that allow you to touch as many lives as possible. Build habits like meditation and keeping a gratitude list to carry forward the inspiration and momentum across changing environments. You’re not just one in a million, you are one in one. Jack, founder of Roko Design explains the process of printing custom apparel and producing stickers while providing the opportunity for attendees to make their own stuff. You work all week, all day but do you ever give yourself a moment to slow down? Take part in a fantastical evening filled with deep house rhythms and sensational surroundings. Get your body moving and let everything go. What is “The Cycle of Opportunities” and how can you be a part of that cycle? Explore the concept of social change through music and understand how to create positive impact . 2 PM | Pop Up Concert with luhx. luhx. is a Synth-Soul band formed in Boston, MA. The group pairs their undeniable groove with melancholy lyrics to create haunting tunes. luhx. are strikingly unique guaranteeing each song leaves you hungry for the next. Their passion for soul comes from listening to artists like Allen Stone and Oh Wonder. EchopathiQ is a duet formed by the musicians Dimitris Menexopoulos (Greece) and Gerson Eguiguren (Ecuador). Blending World Music elements with Electronics, they create spontaneous compositions through interactive improvisation. Their goal is to collectively explore the unique combination of their instruments (Lyra, Viola and Voice) while placing it into a contemporary perspective through the addition of lush sound design. All events are Free Admission.